September | 2015 | Lamb on a bike! Last month I took part in my first Kevin Henry 5k, running for Cambridge Triathlon Club. I’d felt like a fraud wearing a club vest and fell over on a hot, dusty airfield. But this was the last race of the series and we were in contention for the win (each of the 6 clubs gets points for each runner, as well as for the fast finishers), so on went the vest and I cycled out to the University Athletics Track. The sun was in my eyes as I rode along Madingley Road, in a foul mood due to a shocking day at work. While I locked my bike up my clubmates ran past on a warm up, so I waved and headed over to where we were doing a group photo. As I smiled for the camera I realised I’d left my garmin on my bike and was keen for the photo session to be over so I could go and retrieve it. I was also keen not to feature too prominently in the photos as I’ve only been in the club for five minutes, I’m not in the peak physical condition that everyone else seems to be in, and I just had my hair cut and feel shy! At the start there was some confusion about the course but it’s only a concern if you’re leading, so I wasn’t too worried. That said, I was gripped by nerves! I think I felt pressure due to incidents in the week conspiring to give this disproportionate importance. Two clubmates were ahead and I resolved to not let them get away, and ignored the fact that they were chatting as they ambled along. As we headed back to the track I concentrated on breathing, keeping my knees up and not running into a post. We rejoined the track and I saw the masses of people who’d already finished – I was definitely in the bottom quartile! With 200 metres to go I focused on not looking goofy for the photographer on the line, who totally missed me and my vanity was for nothing. I stopped my watch. 25:50, my first 25:something! I’m really pleased. Yes, it’s still slow. But it’s progress, and shows that the work I’ve been doing is starting to pay off. It’s motivating me to train more and get better – I actually think it might be possible. I could have pushed harder at the end but I wasn’t sure of myself. As a bonus, at the end I spotted a familiar-looking face, beaming after running sub-21 – my twitter pal Lauren! It was cool to meet her in person. PB’s in the evening sun. Happy days. 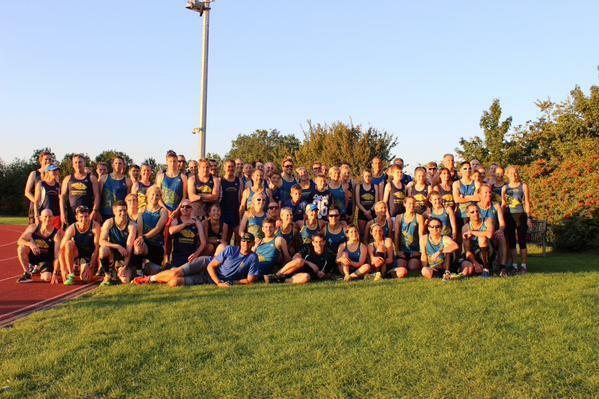 AND Cambridge Triathlon Club won the league, both men’s, women’s and overall! 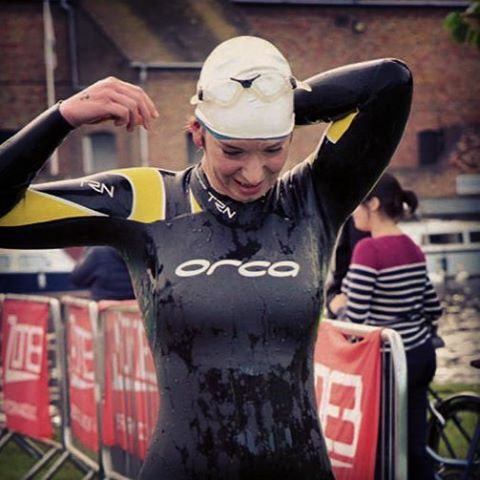 The final race of the season and my very first Olympic distance race! I missed the race briefing as I was queuing for one of the few unblocked portaloos, so quizzed my fellow competitors on the water’s edge. “Where do we swim to? Which buoy?” The water was cold but not shockingly so. I tried to let as much water in to my wetsuit as possible before the start and did some comedy shrieking. The horn went and we swam off in a flurry of neoprene arms and white latex hats. I was all over the place, breathing on pretty much every stroke and feeling bad. Everyone swam away. I switched to breaststroke to try to get my breathing more settled and by the time I reached the turnaround point of the first lap I felt a bit better. On the return, the boys from the wave behind started overtaking and this unsettled me. The second lap was less eventful although my goggles filled up twice and I burped a lot underwater, which is a strange sensation. I hauled myself out of the water, with no idea of how long I’d taken (ages). I got my wetsuit stuck on one foot but eventually freed myself without toppling over. It occurred to me afterwards that in transition I am like a newborn horse: staggering about, covered in a weird membrane (wetsuit) and mucus (mine) and poo (swans), until I figure out how my legs work. 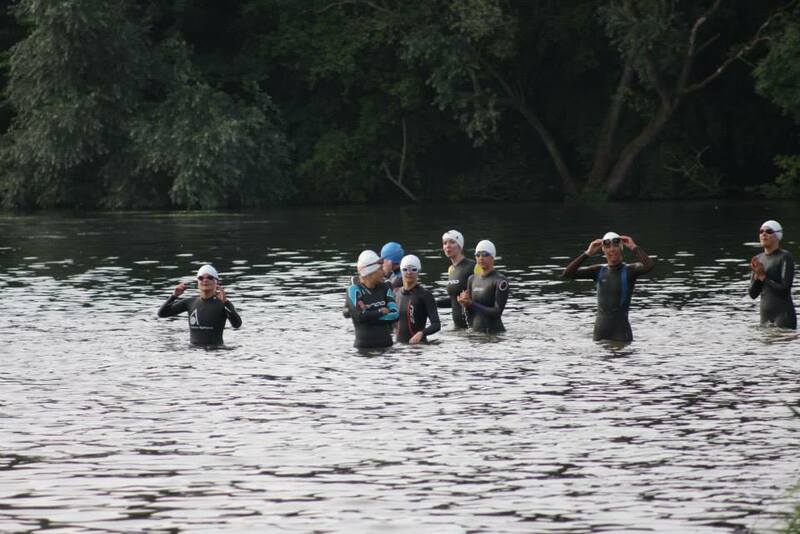 I overtook a few people – however there weren’t that many people to overtake as my swim and transition had been so slow. I’d looked up the course briefly and saw that there was a hill at around 10km; however I’d obviously not paid all that much attention as I thought the bike was 40km instead of 45km. The hill was fine, both laps, and while the rest of the course was undulating rather than flat, I thought it made it more interesting. The weather was perfect for cycling, sunny and clear and neither too hot nor too cold. I saw quite a bit of roadkill (foxes, mice, a stoat) and other than my right hand going numb and my toes going to sleep a little, the time flew by. I have no idea what took me so long in T2. I was about to head off when I remembered my Cambridge Triathlon Club vest, but this can’t have lost me all that much time. I set off, feeling leaden-legged, but going too fast. It’s hard to tell what your legs are up to when you get off the bike! I was immediately glad I’d stopped for my Cambridge vest as I was cheered by fellow club members and spectators. Another club mate ran with me for a minute (until I realised I was going unsustainably fast) and we got a few “looking good, Cambridge ladies!”. The first lap went by quickly, and I grabbed some water at the aid station as I began the next lap. With each lap the number of runners thinned a little, but I could see I wasn’t last and could also see I was doing a reasonable time. I stopped for a little longer at the aid station at the end of the 2nd lap, and again on the 3rd, when I finally finished the gel I’d started at the beginning of the run (my only nutrition throughout the race!). By the 4th lap I felt tired and was moving quite slowly (including a sneaky walk, when a couple on a bench asked me how far I was running), but I was still moving and intended to carry on this way. I ducked under the bridge, rounded the corner and could see the finish line, semi-hidden behind some weeping willow trees. I passed two dog walkers and heard one ask the other “do you think there’s a race on?”. 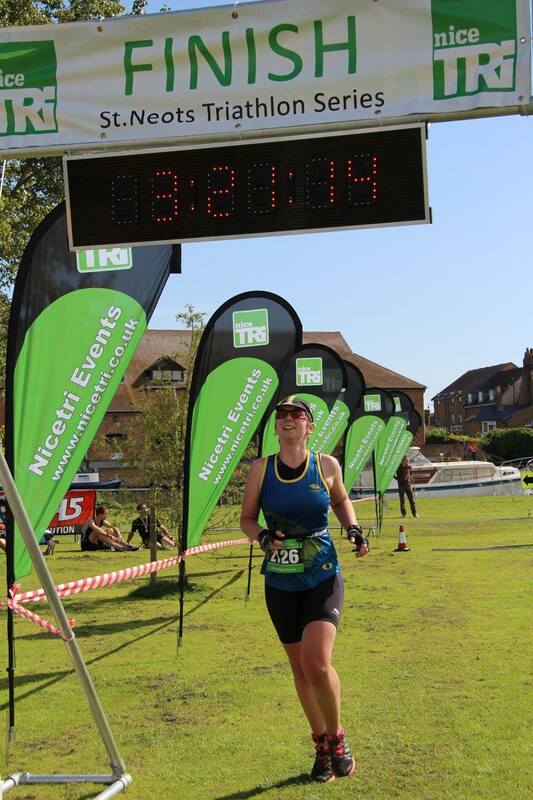 I reached the end of the lap and into the finishing chute, in the sunshine, spectators clapping, feeling happy – and tripped on a clump of grass and went flying! Luckily I saved it and crossed the line laughing and feeling relieved. Swim – since swimming 1800m for the Cotswold 113, I’ve swum a couple (and I mean only a couple) of times. I went to the lido the other week but almost immediately had stabbing pains in my ears and got really dizzy, and had to leave. However, the lido is near my work and I should make more of it. Every time I go to the indoor pool I get really angry with people swimming in the wrong lanes or STANDING in the lanes. Last week I threw a float at someone for swimming into me, so I’ll try to go to the lido between now and the race for a last-minute practice. Bike – I have every Wednesday off work and I try to go for a bike ride in this time. Normally I do around 40km, but would like to up it a little. I cycled 100km on one of the hottest days of the year, and other than it being over 30 degrees and having to stop to buy a Calippo and put it down my vest, it was fine. And I cycled across Europe last year. I’m pretty sure I can get round the bike… it’s just whether I can do it on my Time Trial bike. Run – I’m trying to run more and run better. This means running about 30km a week and trying to mix up short fast runs with long slow runs. I’ve even done some intervals! I enjoyed intervals but am yet to see any amazing improvements in my times. I did a 10k recently but had a stomach bug so will discount that (59 mins) and have done 2 parkruns recently, the most recent being 27:30. Running seems to be an entirely mental thing, as ever, as I just don’t believe I can do it. Every time I start a parkrun I think “this could be it!” and then I get halfway round and give up. Cambridge parkrun is quite tricky if you start at the middle of the pack as at least the first 1k is stuck behind people, so you have to be able to get faster as it clears – not get slower because you give up! I set myself the aim of doing a 25:00 5k more than a year ago and I’m still nowhere near, which is depressing.